Tonight new councimembers Strickland and Walker got a pretty good taste of typical council night. Something of everything. The surpise was the valor Eastside Tacoma residents demonstrated by their turnout in council chambers in support of the Alcohol Impact Area for much of Eastside Tacoma. Led by Pat McGregor who has a significant on-line presence, Eastside residents turned out in droves to support the formation of an Alcohol Impact Area in their neighborhood. Along with the neighbors were two ministers from local chruches. The testimony consisted of one story after another of chronic inebriates (drunks) sleeping in the area, being aggressive, creating garbage and generally creating fear, havoc and the loss of the quality of life. If adopted by the Liquor Control Board, it would bar retailers in an area from selling extremely low cost but large volme and alcohol content liquor. Nice going Eastside. Keep us informed and let us know when your coffee shop opens. by Jake on 1/9/2008 @ 11:53am Don't forget the South End as well! It is just as big as the Eastside and they had a huge influence. I think Pat lives in the South End and not the Eastside. by Erik on 1/9/2008 @ 11:58am Don't forget the South End as well! It is just as big as the Eastside and they had a huge influence. No doubt I have my territories and districts confused. I will have to do a map overlay analysis tonight of the AIA and the neighborhood and buisiness districts. by SouthEnd on 1/10/2008 @ 2:12pm Thanks for the kind words, although I only have a significant presence if people actually read my rantings!!! by Catherine on 1/10/2008 @ 4:00pm You would be surprised how many people I know that live in Tacoma and have never even driven around East or South Tacoma. Pat you deserve much credit in this as you were kind of the community glue. Also ,Bob McCutchen and many others deserve thanks. What was overwhelming to me at the Council meeting was that the lineup of folks giving testimony. A very short time ago it was difficult to get two Eastsiders to a council meeting to testify â€“ esp about the same issue. 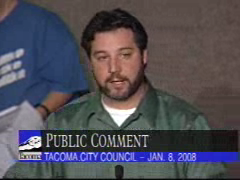 On this issue we had significant representation of the South, East, New Tacoma/Downtown, Central, Hilltop areas including individuals with several neighborhood councils, and neighborhood groups (Dome Top, Whitman, others) . When we can work together and watch out for one another, well we can really transform our City. Pat keep us posted, and let us know what other support we can provide. Thanks again! by NineInchNachos on 1/10/2008 @ 4:15pm Go Marty! Your almost there. You may have already looked at the documents and testimony from the earlier AIA. The best one is the testimony" target="new" title="http://www.liq.wa.gov/minutes/reg011119.asp\">testimony">www.liq.wa.gov/minutes/reg011119.asp\">t... before the Liquor Control Board by Hilltop Activists and others on November 19, 2001. There sure were alot of people who testified. Deputy Mayor Phelps, Faker, Jeanie Peterson, Tacoma Pierce County Health Board, Tacoma Police. WSU SESRC Evaluation of the Tacoma, Washington Alcohol Impact Area.